Please bear in mind that this article was written over two years ago. (The article was published in The Pump in September of 1992.) When prices are mentioned, please allow for this delay, as current prices are often a far cry from those quoted. Nearly ten years ago I did a black & white article for the Pump on chop plates. An update is overdue. Many of those in this current listing were unknown when the earlier article was written. Chop plates are usually defined as flat, non-ruffled plates measuring at least 10” or more. 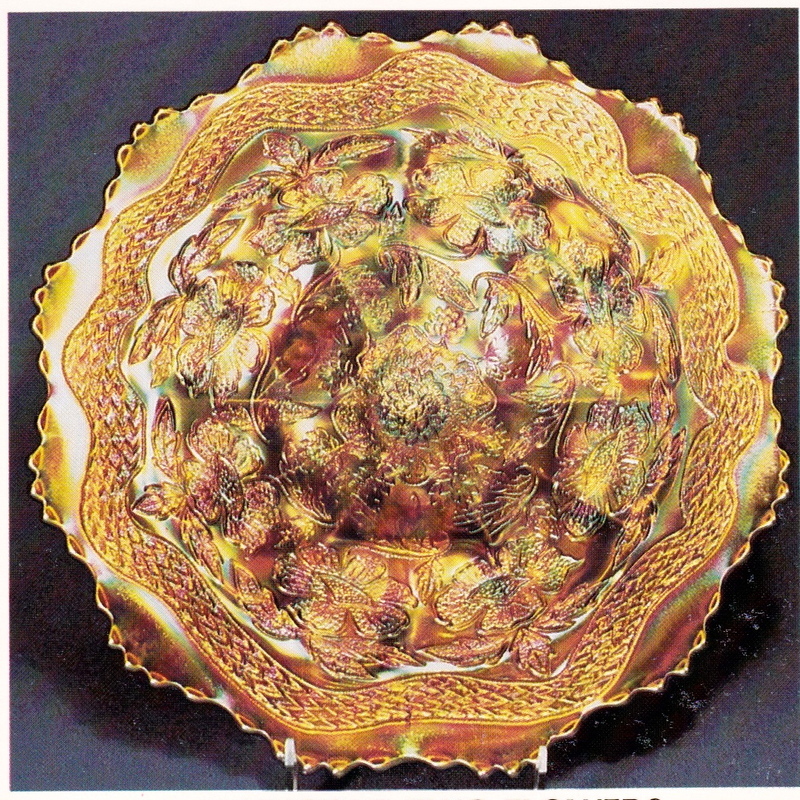 There are a number of rare plates which tend to “fall between the cracks.” They are too large to be classified with the standard 9” plates but too small to meet the 10” criterion for chop plates. Examples of these are the very rare Millersburg Trout & Fly, the Birmingham Age Herald & even the Fenton Holly which is quite rare in green. LOTUS & POINSETTIA (WATERLILY) – To my knowledge only one of these has been documented. It is marigold and is owned by Bob and Dottie Gallo of Michigan. FANTAIL (FENTON) – Two of these are known. Both are blue. One of these sold at Mrs. Hartung’s estate auction in 1983 for $1,000. The second one is quite badly damaged but still brought $750 when offered at auction in March of 1989. 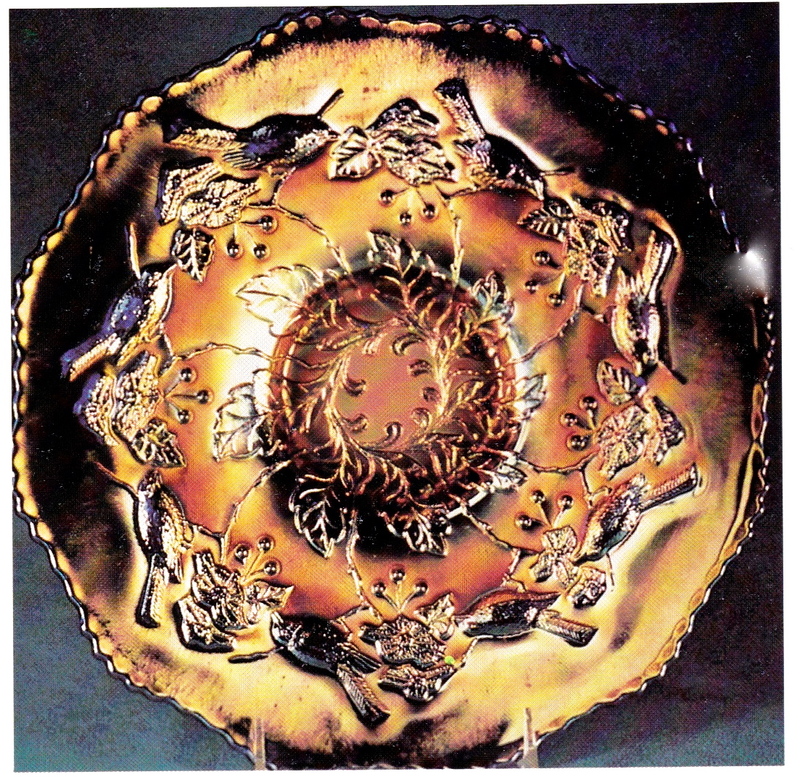 STAG & HOLLY (FENTON) – This 12” plate is the flattened version of the large ball footed bowl. They came from the same mold. Known only in marigold, it will sell in the $750 to $1,000 price range. 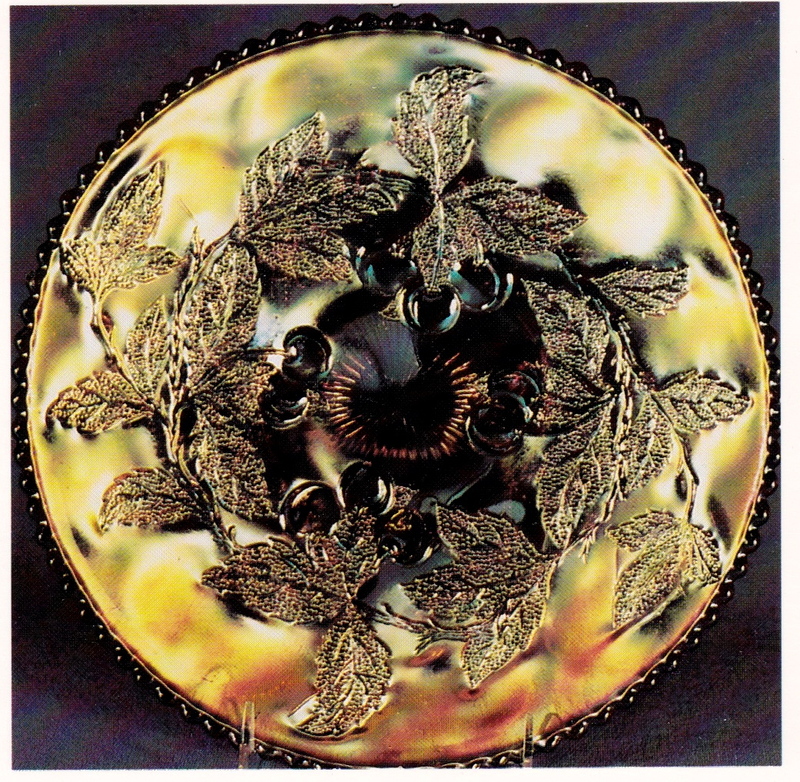 TWO FLOWERS (FENTON) – This piece is identical to the Stag & Holly, above, except for the different interior pattern. 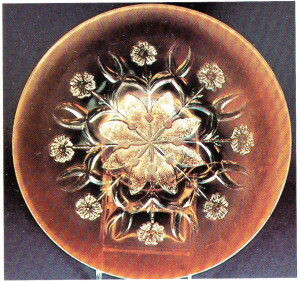 The bottom portion of the mold was no doubt used in making each of these patterns. The Two Flower is likewise known only in marigold and will sell in much the same price range as the Stag & Holly. FLORAL & OPTIC (IMPERIAL) – Known in red (rare), white, & marigold. Comes on short, stubby, squared feet and usually with a “stretchie” finish. Many of these are very rare. They lose much of their desirability, however, when the pattern cannot be seen unless displayed backwards. The plain interior on these pieces made them much more practical, however, when used as serving dishes. INVERTED THISTLE (CAMBRIDGE) – I know of only one of these rare pieces. It is purple and is owned by the Knights in Atlanta. COSMOS & CANE (U.S. GLASS CO.) – One known in white and one in honey amber. 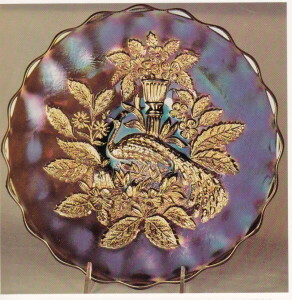 GRAPE & CABLE (NORTHWOOD) – This piece could fall into either of these special categories as it is footed and has the pattern on the reverse side. I know of one of these in amethyst but a second one has been reported. 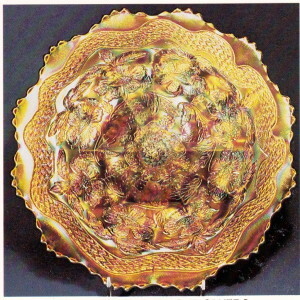 It measures 14” and is flattened from the footed centerpiece bowl. HOBSTAR & FRUIT (WESTMORELAND) – Only one is reported. It is ice blue and measures 10 1/2”. This is indeed a rare one but is one I have not seen. ROSE GARDEN (EDA GLASS WORKS – SWEDEN) – This is another one-of-a-kind. It is blue. OVAL & ROUND (IMPERIAL) – Found in marigold only. 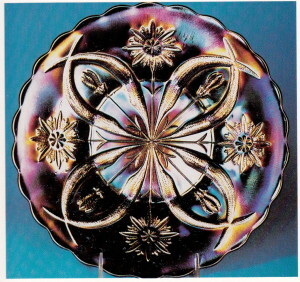 STAR MEDALLION (IMPERIAL) – Made in clambroth & marigold. LOUISA (FENTON) – One reported in marigold. I don’t know if it is footed or on a collar base. SODA GOLD (IMPERIAL) – Known only in marigold. WIDE PANEL (IMPERIAL) – These are found in marigold & red. They will sometimes measure as much as 14 1/2”. PEACH OPAL PERSIAN GARDEN (DUGAN) – Two known in this color. Also very rare in white & amethyst. 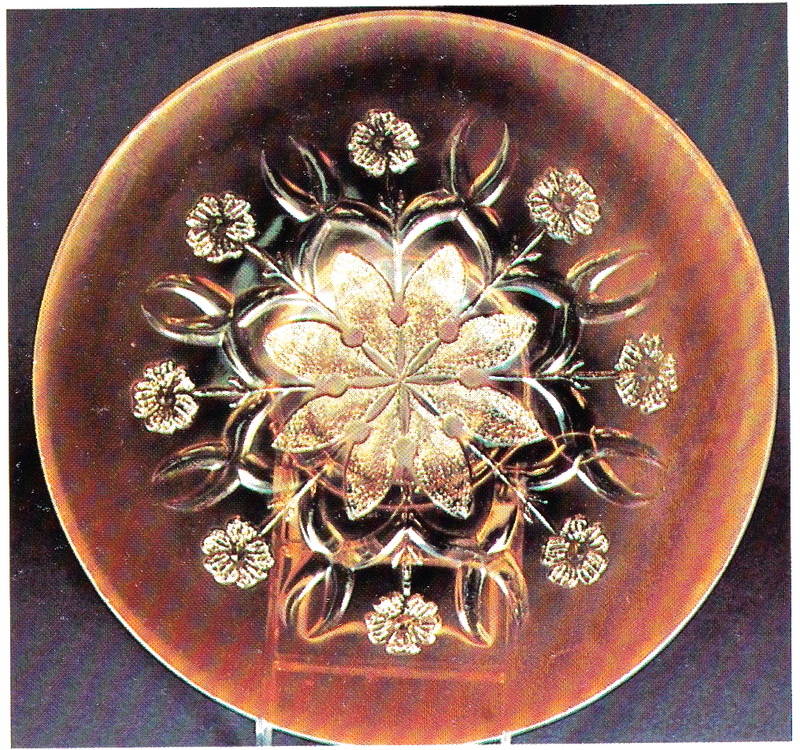 AMETHYST MILLERSBURG PEACOCK & URN – Three or four known in amethyst. It’s a toss up as to whether this should be No. 1 or No. 2. It is also very rare in marigold. 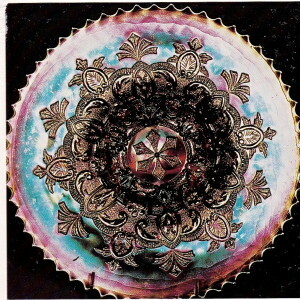 PEACH OPAL HEAVY WEBB (DUGAN) – Only this one example is known. This piece was rumored for many years but confirmed only in recent years. A massive, spectacular plate that measures 12 1/2”. 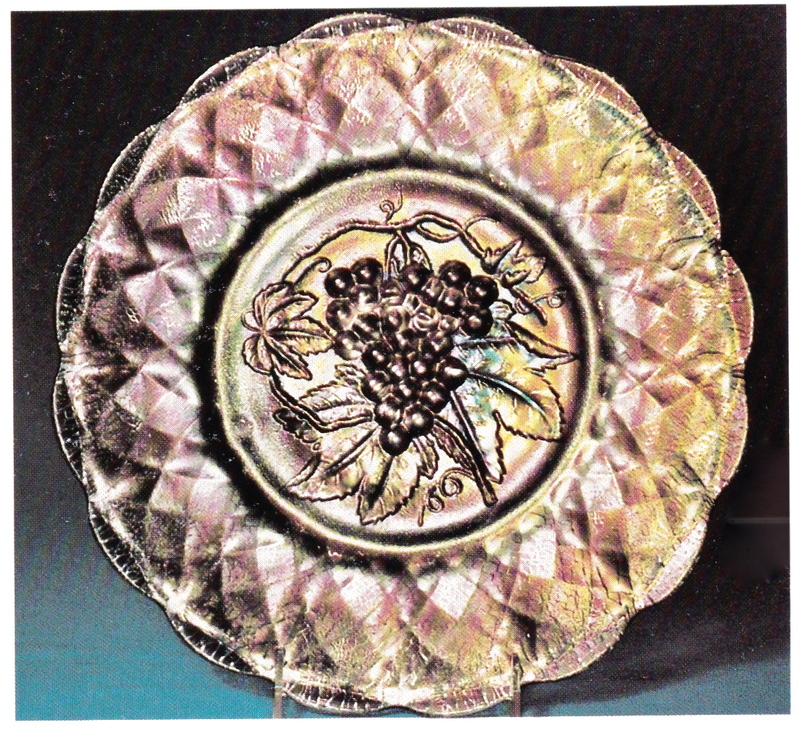 WHITE GRAPE & CABLE (NORTHWOOD) – The Carnival community was stunned when Joe Corothers turned up this plate in 1989. It quickly sold to the Vinings, Chatsworth, GA. This piece is flattened from the master ice cream bowl. 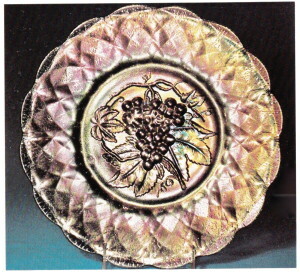 The pattern is thus on the interior, in contrast to the footed Grape & Cable plate which was shaped from the centerpiece bowl. AMETHYST, GREEN, & MARIGOLD HANGING CHERRIES (MILLERSBURG) – Only one or two examples are confirmed in each color. An amethyst variant of this pattern is also confirmed. it is plain instead of having the wide panel on the reverse. It has a scalloped edge like the standard plate, but these scallops are also fluted whereas they are smooth on the standard version. MARIGOLD LITTLE FISHES (FENTON) – Only the one example is confirmed. I have seen only a picture and I am not certain if it is footed or on a collar base. The smaller pieces come both ways. AMETHYST & MARIGOLD BLACKBERRY WREATH (MILLERSBURG) – Only one example of this 11 1/4” piece is confirmed in each color. GREEN WISHBONE (NORTHWOOD) – Only the one green plate has surfaced to date. It still turns up from time to time in amethyst & marigold. ICE GREEN & WHITE PEACOCK & URN (NORTHWOOD) – I can confirm one in each color. Also very rare in marigold. Scarce but available in purple. AMETHYST DUGAN CHERRIES – Only this one rare example is known. 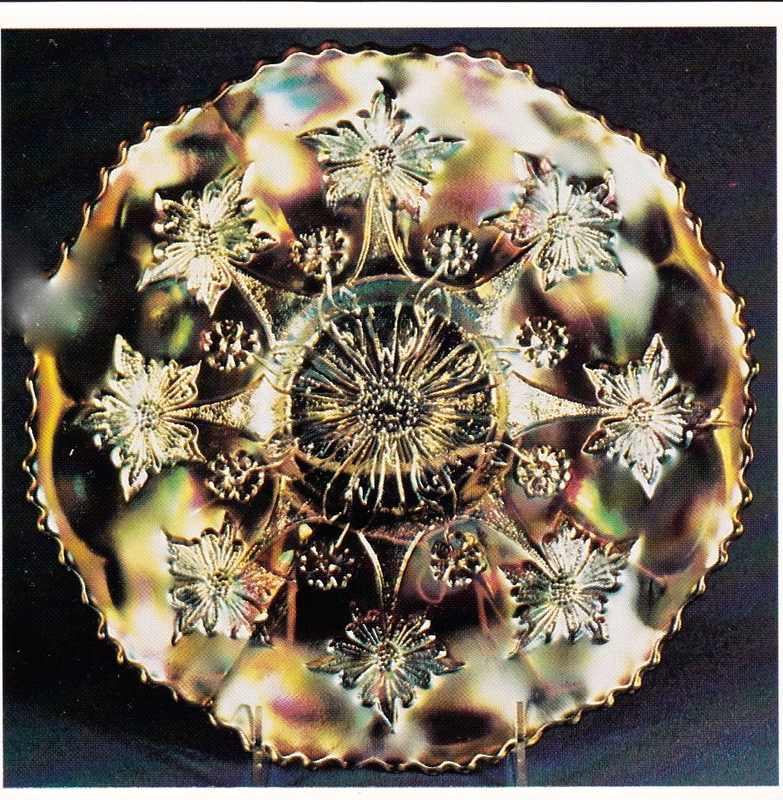 AMETHYST RAYS & RIBBONS (MILLERSBURG) – Here is another one-of-a-kind chop plates. So few Millersburg plates are known in any size, that it can be safely said they are whimseys. There just aren’t enough of them known to consider them a production line shape. 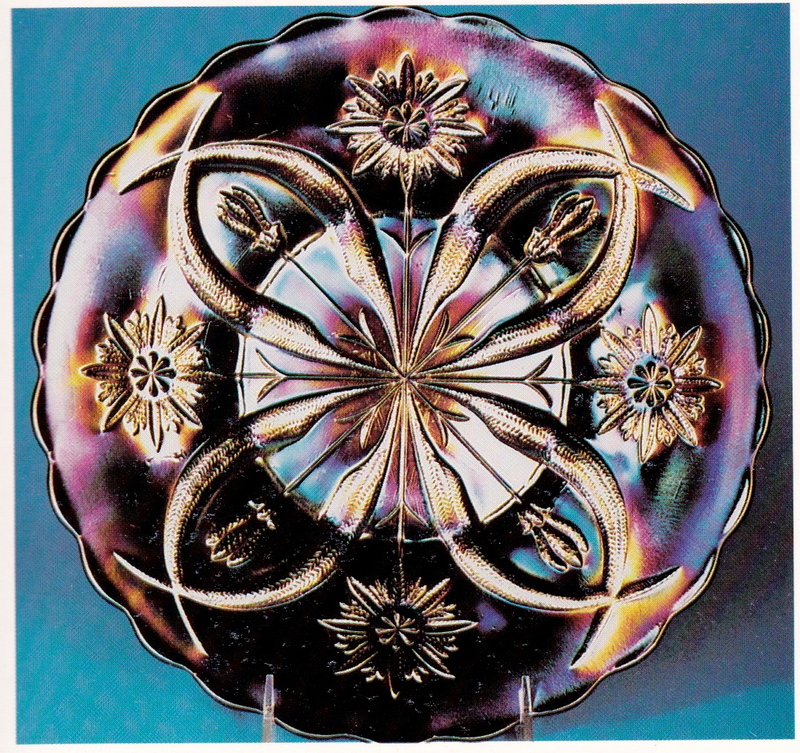 PURPLE FOUR FLOWERS (DUGAN) & PURPLE VARIANT (Eda Glass Works, Sweden) – The VARIANT is largely unknown and its rarity not fully appreciated. 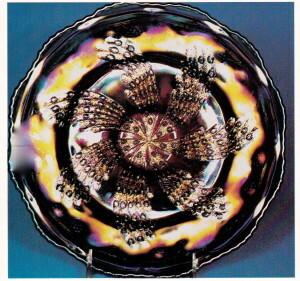 It is shown in Photo #11. The Dugan version of this piece is 1/2” smaller (10 1/2” vs. 11”) and the edge is completely smooth whereas the variant carries a smooth scallop. The VARIANT also carries a ring of thumbprints on the reverse and unlike the Dugan version the base is ground. 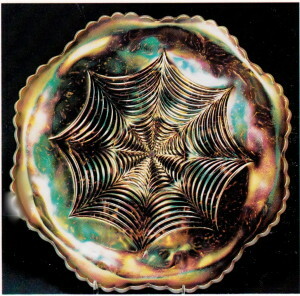 The Dugan plate is usually seen in peach opal. This purple, pictured, is much more rare. I have seen the VARIANT only in purple. 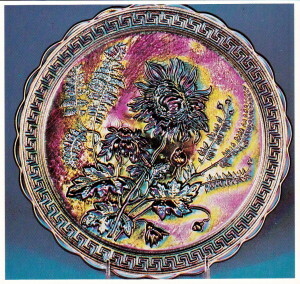 To confuse the issue even more, the VARIANT is found in a 9 1/2” plate in various colors. From a rarity standpoint it is not in the same category as this 11” version. I have seen only two of these 11” VARIANTS. PEACH OPAL WISHBONE & SPADES (DUGAN) – The purple plate is very scarce and beautiful. It might even outsell the peach opal but is not nearly as rare. 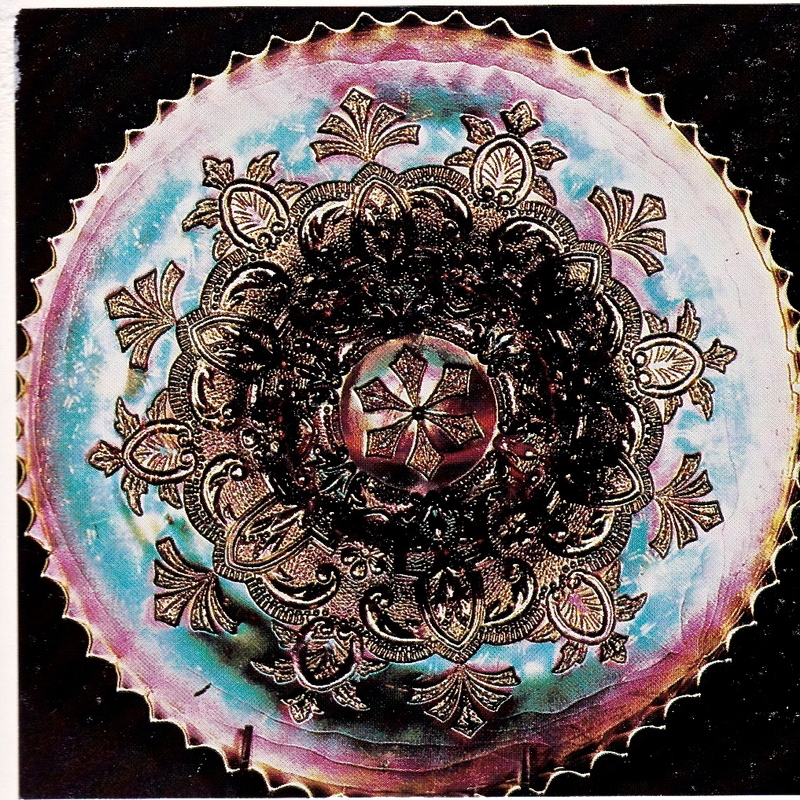 In fact only two peach opal plates are confirmed. 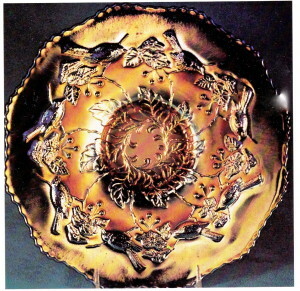 We must also mention the Farmyard purple bowl that has been flattened out and turns up only at the outer edge. It has sometimes been called a chop plate but technically must be called a bowl. 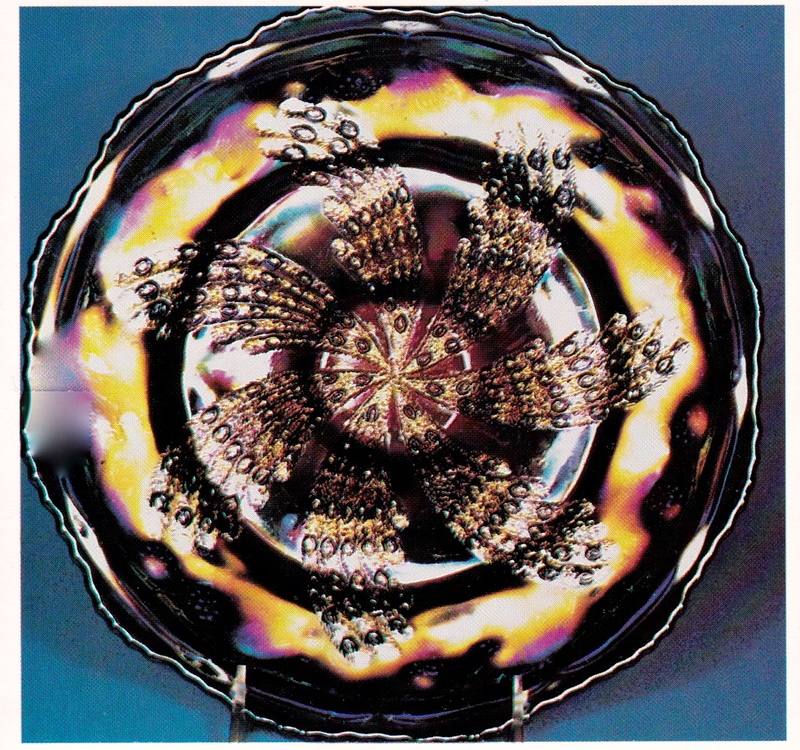 It is a very rare and unique piece regardless of what we call it.